Help! What Can I use a and a For? Easy to start, Easy to learn, Easy to do, Low Cost, High Profit, Low Maintenance, Environmentally Friendly! Instantly add a Dry Car Wash service to your existing car wash or auto detail service TODAY! Very Very low startup costs! For well under 3k you can be running your own Car Wash! 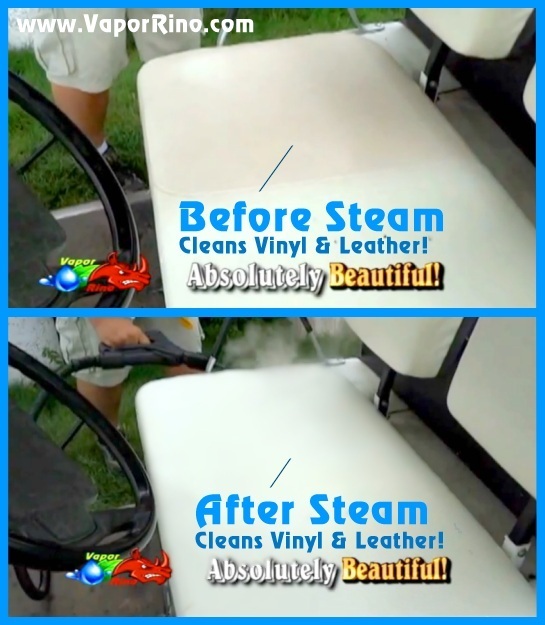 1 Man + 1 Steamer = Complete Car Wash Business with unlimited potential! Expandable! More Men + More Steamers = a speedy full sized car wash service handling a line of cars. No Franchise fees! No Hidden Fees, NO CONTRACTS! Just you set free to run your new business! Only 1 gallon of water per hour in dry mode vs. hundreds of gallons using a traditional car wash.
No special location needed - Do it anywhere! No expensive large facility! 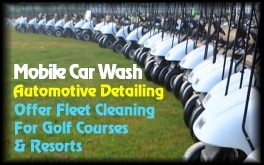 Can be Instantly added to your existing auto detail business or car wash service. No fear of current or future water restrictions and usage taxes! Virtually no waist water… EVER! No underground tanks, no pumps, no recycling! 100% Environmentally Friendly - customers LOVE this fact! A Powerful Sales Pitch! Small and safe investment, Easy start up, Easy to learn, Easy operation! Less overhead and capital invested means a faster return on your investment and greater profit over all! You can run your dry car wash service in one of several ways. 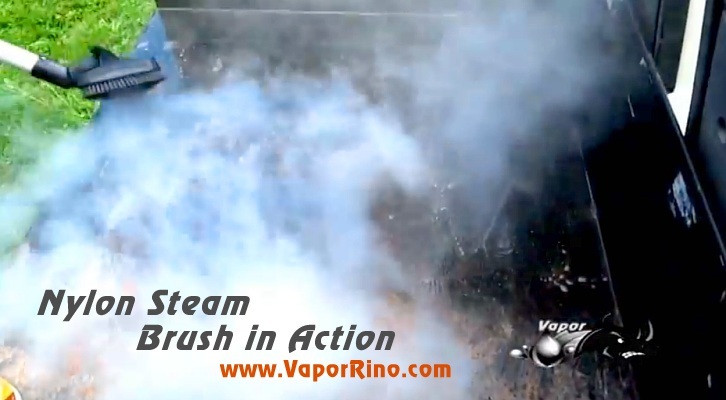 First, there is the 95% dry vapor steam. 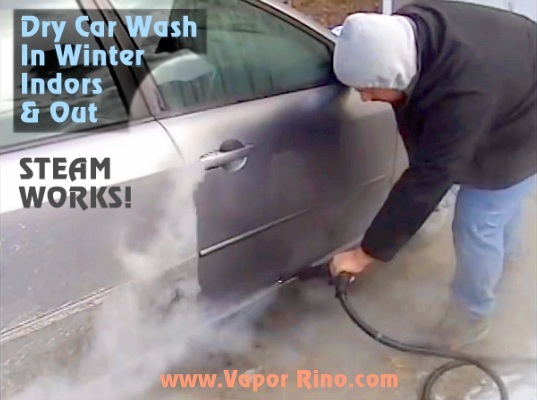 This "dry" vapor steam allows you to wash cars with zero waste water. The next two ways speed up the job greatly while offering amazing flexibility when combined with steam. 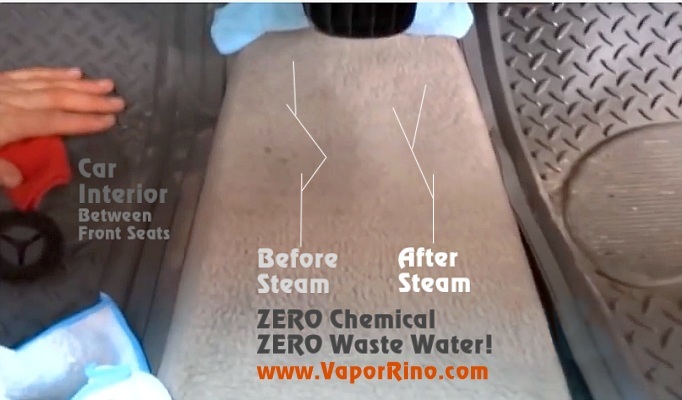 Again, no large run off when using a Vapor Rino and the work can be done outside OR inside your home, garage or work place. 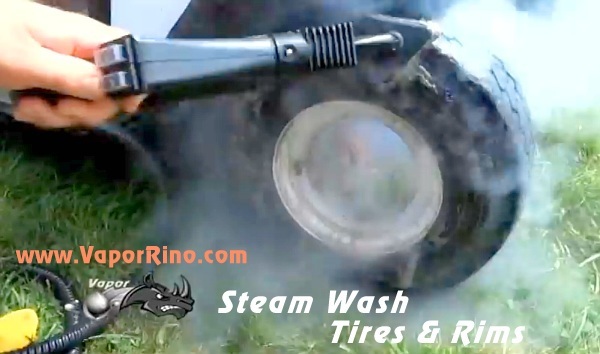 Keep in mind, the Vapor Rino is an all electric system. That means NO harmful exaust fumes. Indoors or out, the Vapor Rino is ready when you are. First Method: You can go all dry vapor steam. This option allows you to wash a car with ZERO water run off. That's right, no recycling waste water because there is none. You can see this being done in the car wash videos above. This is the method most commonly shown online. Why? 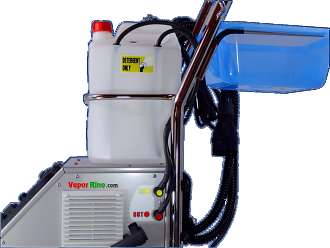 Because most vapor systems only have dry vapor output. Our system gives you the best of three worlds - dry, wet & soapy! 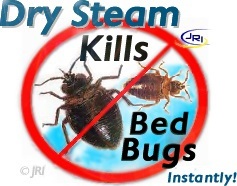 So you can use Dry steam, Dry steam and water or dry steam and soap injection. All of these options have a fully adjustable flow control. Awesome. Second Method (Fastest): You can activate the hot water injection system and using simple tap water allowing you to simultaneously clean the car with hot water and steam. This will allow you to quickly blast off heavier dirt and at the same time continue the wipe down of the car. 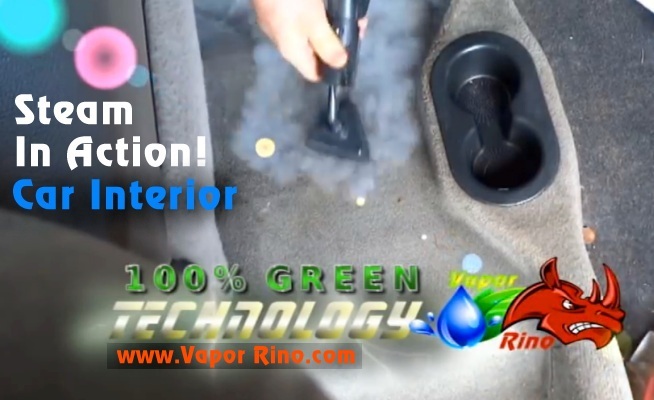 Using hot water injection GREATLY increases your speed when running a mobile dry car wash. Never buy a "commercial steam cleaner" without hot water injection if you intend on washing vehicles. Remember, the hot water or hot chemical injection button is ON THE GUN! This means you can switch it on and off at will, as needed. A truly critical feature if you are going to do any serious cleaning. Third Method: You can use a hot soapy wash to pre-treat the vehicle or use a "no rinse" solution. This might be useful if the vehicle is very dirty. 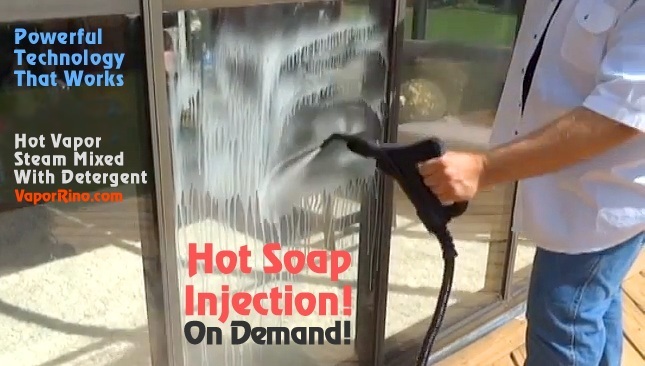 Using the fully adjustable chemical injection system you can inject hot soap (or simple water) or hot Zip-Wax solution onto the car, truck, boat or air craft. Using a was-n-wax solution allows you to offer your customers an on the fly wax job. You can even use the included horse hair brushes to scrub the surface prior to rinsing. This may be good for greasy work trucks, stickers or heavy grime. If you rather not use the brush you can hand wash with a cloth. If you rather not do that simply swap the chemical jug for a water filled jug (extra 5 liter jug included!) and use the hot water injection to rinse off the soap suds. 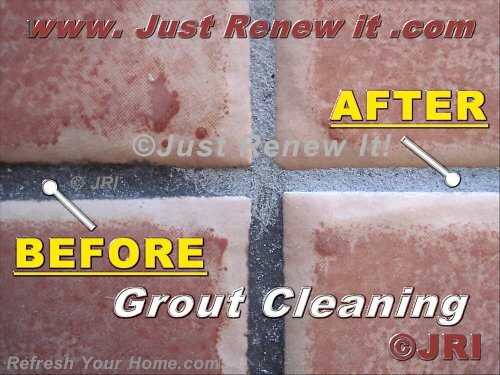 Again, this approach uses a fraction of the water that you would consume using a traditional pressure washer or garden hose. Once the soap is rinsed off you can do you wipe down using dry steam only or just towels.